This started out as a “chic sighting”, since I was seeing a lot of women in simple dresses, with great accessory choices. But I grew to see that there was a bigger lesson here; all this week, you’re going to see variations on five different neutral summer dresses. Enjoy! Amazing! I think my favorite combinations would be the red and black and the yellow and black. I truly need a basic black dress like this. Possibly one of my fave posts yet from you on the combos. I love these outfits; classic but chic and totally timely. I have bits and pieces of those accessories and, of course, the black sheath but I don't even have remotely your ability to put an outfit together, so you've given me some great ideas here. Brilliant. Thanks; it's just so fun! I love this post. Have been following you for a short time (via A Femme d/Un Certain Age), and this has been my favorite one so far. We all have a little black dress in the wardrobe and this has given me so many ideas! Thank you. I hope you will consider doing this in another color besides black. It is too harsh for me. I try to wear brown or gray. I love the post and will use it for summer dressing ideas. Tks! Thanks for making it look so easy! Janice, you are so talented! I have learnt so much from your blog. I have been clueless about accessories my whole life but slowly slowly it's starting to make sense 🙂 THANK YOU!! Awesome! Thanks for all the ideas. I always think you've reached your pinnacle . . . so I'm saying it once again. The black/white combo is amazing. My heartiest agreement with the other commenters. When I discovered your blog I had reached a milestone age that was making me think "old". And while, in previous decades I had no problem putting together outfits, this AGE thing stopped me in my tracks. Your blog, for the most part, is timeless. The outfits you put together have given me inspiration and put me back on track over the past year. I especially enjoy the use of scarves as they have always been my "trademark". It's now a "daily" for me…and I wanted to express my appreciation. Well "sisters" I'm too reaching my milestone birthday on 1st July !! !and I couldn't agrre more that Janice's outfits make me think that the best part of my life it's just arriving… I check your blog daily and print the outfits… as you can see I'm totally converted…. Thanks so much… and good luck with your new job!!!! I don't think black can carry pastels well, unless you count ecru, nor do I like the assault of black and with only red, which can look harsh and feels all wrong on me. Yet I have seen black/red on others and loved it. Funny, isn't it? You've reminded me of the charm of b/w with gold, thank you! I learned two important things since finding this blog late last year. I have way more clothing combinations than I ever thought, and great accessories are what make an outfit special! Thank you. 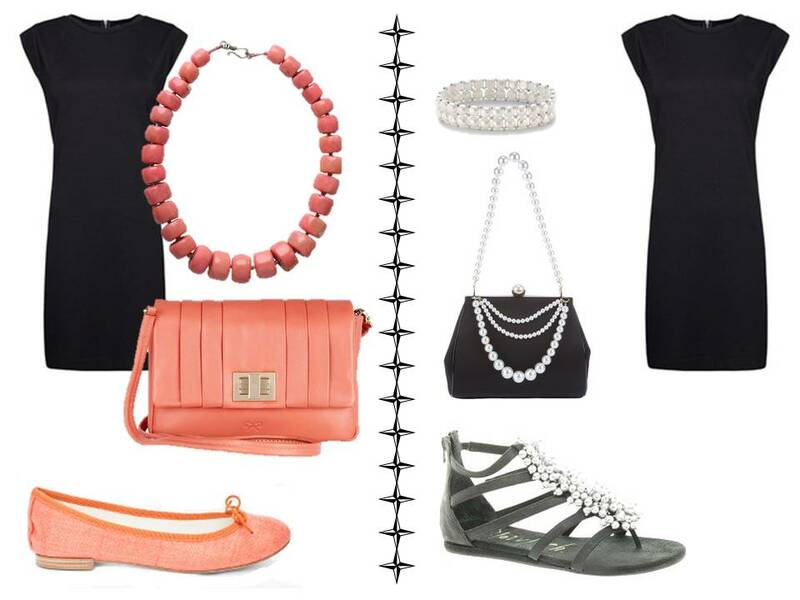 Amazing how many different looks you can get from one simple dress by adding different colored accessories. Great post. Will echo the voices of the others who you have obviously reignited enthusiasm in for our LBD's. The key point for me is that most women DIE over seeing/knowing how to wear a key staple item many ways to get many looks. It is instant value and, of course, keeps packing light so we can find more great accessories, n'est ce pas? Great blog. Looking forward to a fun week. WOW! Thanks so much for this! My basic color is navy and I have a navy dress similar to this one. Can't believe how many possible combinations I already have and didn't know it! Your blog is so wonderful and inspiring. 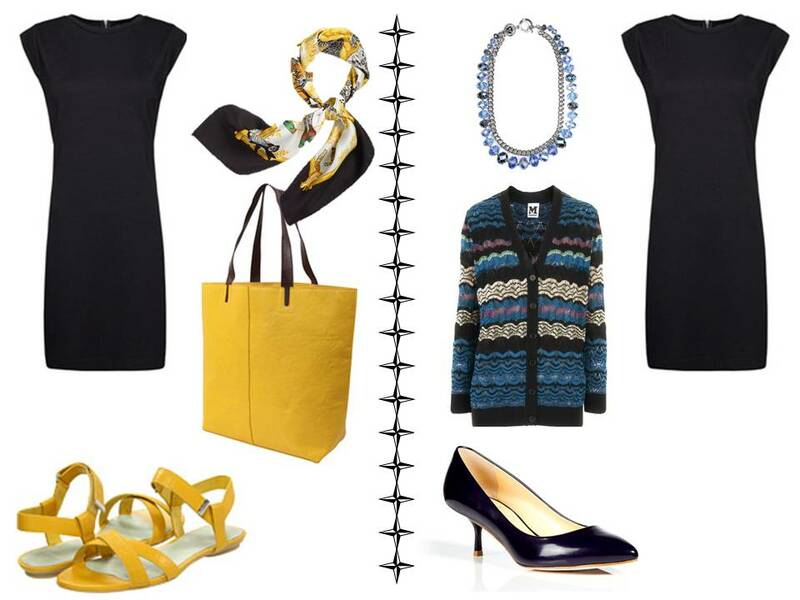 Stick around – the rest of the week will revisit this idea with dresses in beige, navy, grey and brown! I have this dress too that I keep 'for good' but this makes me think differently about it. I also have a tendency to save things "for good." Since reading this blog, I have begun to think differently. Waiting for just the right event is actually wasteful. It is great that Janice has shown us how to dress an outfit up or how to look artfully casual. We can get so much more mileage out of a wardrobe that way and it feels great. I find that it is actually fun to pick out an outfit now that I have a different perspective. I have been trying to convince myself that investing in a dress would not be a waste. Being retired and living in a very casual area, I don't seem to have opportunities to don a dress. But my husband corrected me and said there is no reason why I couldn't wear a dress in a casual way and not be "too dressed up." You have given me every reason to look for a dress to add to my core wardrobe. The suggestions above are fantastic. Thank you, Janice. I hope Mango is giving you a commission on dress sales. I predict this on will be popular. I know my next move will be to look at their site! Sorry to have stumbled across your blog so late, but what I have seen so far, I truly love!! As a Parisian, too, I heartily endorse the guidance you give. (Do you know how many style blogs there are that state they are trying to promote French chic, but are really just providing a tacky pastiche of (vaguely) French-inspired fashion items for some of the major US department stores?? An AWFUL lot!!! Last week, I had a truly exciting invitation to a cocktail party at le Petit Palais (just across le Jardin des Tuileries from le Louvre. The biggest problem was that the invitation stated 18.00-21.00pm. Tricky, because I knew I could never get home from the office, change, and out again. So I wore a simple black sheath, not unlike yours here, with day-time accessories, and then about forty-five minutes before the appointed hour, I nipped into the ladies, for my transformation. I swapped my ballet flats for a pair of leopard-print Louboutin stilettos, worn with some ultra-sheer black stockings, vamped up my make-up to include the obligatory (in Paris) scarlet lipstick, put on some opera-length pearls with a pretty diamond clasp, swapped my leather tote for a little satin clutch, a spritz of my favourite Guerlain perfume, and I was ready-to-go! Truly, a LBD is the most useful piece a girl can have in her wardrobe, and yours is a specially nice one. Thank You!! !